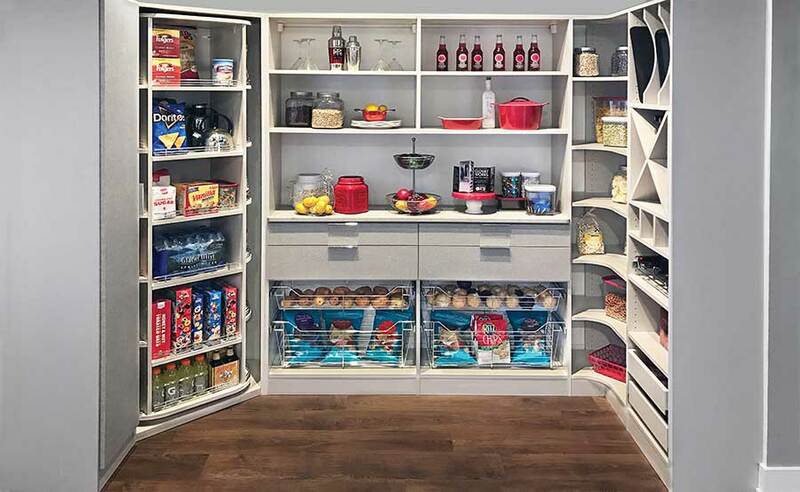 This walk-in pantry is fully loaded with pantry organizers, including the 360 Organizer® rotating corner pantry unit. This pantry design offers more storage than first meets the eye. It accomplishes this by being extremely well organized, and making use of every inch of space. 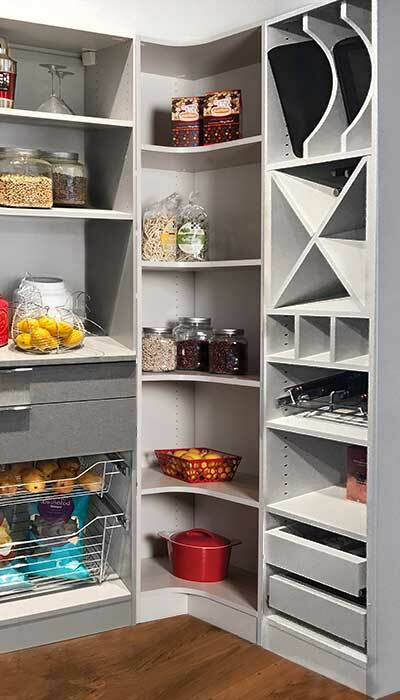 The multitude of different pantry organizers handle everything from wine and beverage service, to canned goods, to plates, serving pieces, glassware, to pots and pans. It includes pantry shelving, pantry drawers, a wine rack, wine cube storage, the 360 Organizer® Rotating Pantry for corner storage, wire baskets, vertical tray dividers, pull-out pantry shelves, curved corner shelves, a 4-stick broom holder, step ladder and step ladder hooks. Key to the design is the 360 Organizer® rotating corner closet unit. All the 360 Organizer® models offer a full 360 degrees of manually rotating storage. They are perfect for putting those hard to reach spaces into service and leave no inch of space unused. This model has been maximized for pantry storage, and fits nicely into a corner of the pantry closet. A combination of deep and shallow shelves allow the most number of products to be stored in an accessible manner. Its unique design prevents items from getting lost in the back. A system of shelf fences keep even the small items in place while the unit it turned like a Lazy Susan. Next to the 360 Organizer® is a cabinet with a door. Although this pantry is intended to be a shallow closet in its own right, the inclusion of this area with a separate door is a nice way to isolate the cleaning supplies from the foodstuffs. 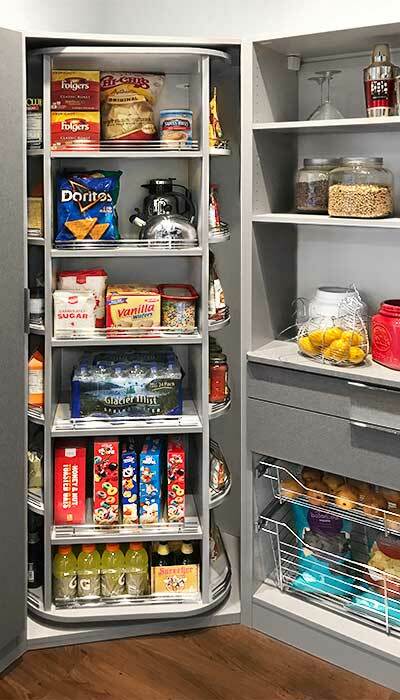 The 360 Organizer® rotating pantry unit is like a magician's hat in the way a seemingly infinate amount of foodstuffs can be placed inside it without overloading. You will never run out of room if you have one of these closet organizers for the corner of your pantry. Pantry organizers include numerous accessories to keep everything organized, such as a pull-out wine rack, wine cube, wire baskets, pull-out pantry shelves and drawers, and curved corner shelves.